We are known for our ‘light touch’ and do not believe in the frozen look, we aim to help you look fresh and natural. Botox® treatments are one of our most popular non-surgical anti-ageing treatments for reducing lines and wrinkles for a fresher, less tired look. Icons-BotoxWith a quick procedure and undeniable results, it is easy to see why anti-wrinkle injections are the most popular cosmetic treatment in the UK. 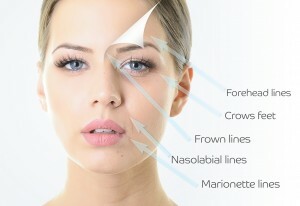 Botulinum Toxin is injected with a very fine needle and is a quick and convenient way to smooth out lines around the face without any need for surgery. After the injections, the muscles will relax and the skin will smooth out over the next 5-10 days. The result is a softer, more relaxed and healthier appearance. The effect usually lasts between four to six months and can be repeated when needed. Most patients require less frequent treatments over time as the muscles ‘retrain’ and weaken from disuse. The procedure is one of our most popular due to its fantastic results and can be done on a lunch break. It requires no anaesthesia or recovery time. The treatment will involve a cosmetic doctor making a series of small injections into the muscles of your face in the area of concern. The procedure is largely pain free, with the exception of mild discomfort which is experienced due to the small needle used to administer the Botox®. You may notice some soreness in the injection site directly after the treatment, but this should subside very quickly. Botulinum toxin has been in medical use for more than four decades, and it is administered in such a way that it only affects your muscles and sweat glands – it does not reach any other part of the body. *results can vary from patient to patient. The price is dependent on how many areas and where on the face that you wish to have treated. We provide a great after-care program for our patients and a free two week top-up if required. A full list of possible side effects will be discussed at the face to face skin consultation. The price for Botox treatment starts at only £190 and is dependent on how many areas and where on the face that you wish to have treated. We provide a great after-care program for our patients and a free two week top-up if required.